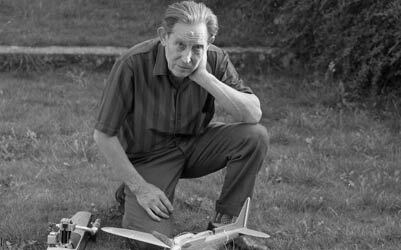 Arthur Weaver, an extraordinary engineer and modeller. There are a significant number of people who have embraced both tethered hydroplane and tethered car racing through to the modern day and several of these were superb engineers in their own right. 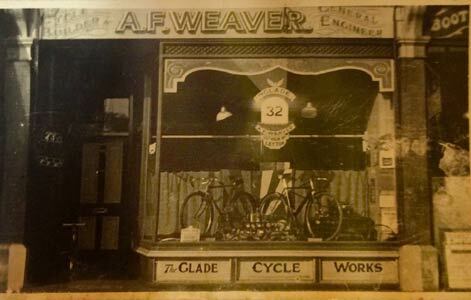 From the days of reading Model Engineer magazine avidly through to our more active involvement, one name has stood out, and that was Arthur Weaver. 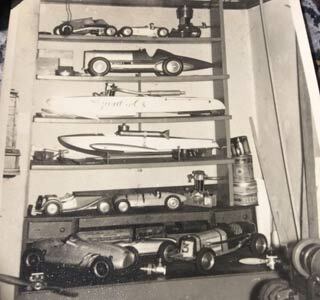 He raced tethered hydroplanes from the early 1940s, joined the growing ranks of tethered car enthusiasts during the mid 1940s with a range of beautifully made scale and semi scale cars before becoming a leading exponent of rail racing into the 1950s. 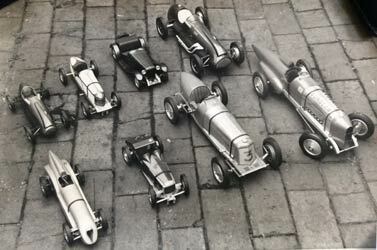 He went far beyond racing as a designer and builder of a multitude of engines, being commissioned to create a series of almost scale cars for a national company. 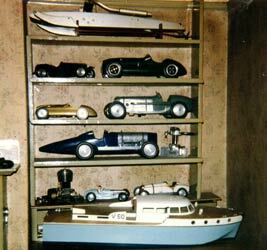 Arthur regularly submitted articles to the specialist magazines of designs and complex building techniques and the cars and boats he created are still much admired and valued. What we did know about him was gathered from titbits of information and conversations with people that had known him in passing, but there was little concrete to go on, except when items that could be attributed to him turned up. 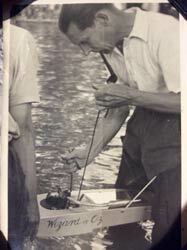 We actively sought out whatever we could about Arthur Weaver without a great deal of success, but each time another piece of information surfaced or a car, boat or engine that could be associated with him came to light we were more determined than ever to piece together a more detailed article on his life and work. Peter Hill had met his son many years ago, but he proved untraceable, we knew that there was a daughter, although we understood she lived abroad, so there we faltered, continuing to add items to the site as they came to our attention. Many of these were gems in their own right adding to the material we had, but still little relating to Arthur until early in 2016 when an email arrived from his daughter who had been told of the content on the website. She was able to provide us with a most comprehensive and enlightening biography of her father for which we were most grateful and forms the first part of our appreciation of him. 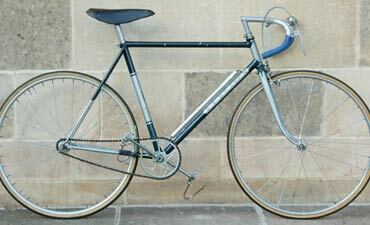 Cycling, bikes and cycle racing was probably his first love. Cycling certainly provided him with his close circle of friends and, after he’d brought ‘the lads’ home to meet his sisters, it provided him with a number of his brothers-in-law. 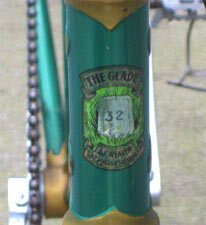 He was an active member of the Glendene Cycling Club and by his mid-twenties he had started his own cycle building business. It was WW2 that brought an end to this period of self-employment. As a trained toolmaker he was deemed ‘reserved occupation’, which meant he was not ‘called up’ but was sent to work at the Planet Jig and Tool Company in Colindale. A house requisitioned by the government came with the job and he and my mother moved with their two little boys to Hendon. After the war ended they stayed in Hendon. During the war my mother had resumed her nursing career and was working at Colindale Hospital and Dad went to work at Armstrong Cork Company on Honeypot Lane, Kingsbury. There he helped to design machinery for inserting the cork into the crown caps. 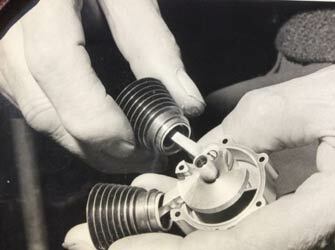 It would be around this time that he started making model engines and his first model car. It was at Armstrong Cork Company that he met an amateur puppeteer named Jim Fletcher. 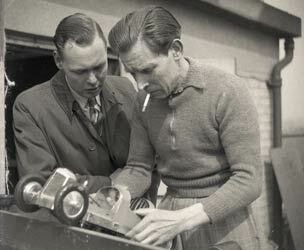 Jim must have been thrilled to find someone who thought it was great fun to design miniature bellows systems to be built into the puppets chests so they could smoke cigarettes, something not frowned upon in the 1950s. I am not sure exactly when he left Armstrong, but I know he was working there when he contracted TB. A year after his illness our family experienced another devastating blow. The older of my brothers, Eric, was killed while cycle racing. He was on demobilization leave from the RAF and had only been home for about a week. My parents were devastated. I think Dad worked at Honeypot Lane until his involvement with AMCO in Alperton from 1953 until productions ceased there in 1955. After that he worked for a few years for Westway Models a company that made, mainly, promotional and marketing models for the airline industry. 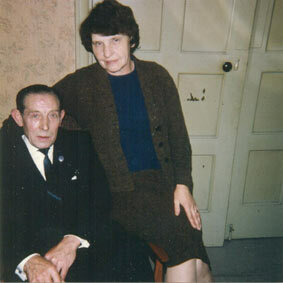 Dad often succumbed to ill health during winter and about 1959 or ‘60 he was particularly unwell. Whether it was on medical advice or because he (or my mother) realized that fiberglass dust, paint fumes, adhesive fumes etc. would not help his recovery, it was decided the company would send materials to his home and he could complete his work load in his own workshop and in an environment he could control for himself. This went very well and became the catalyst for his self-employment as an experimental and prototype engineer. He became a member of the Institute of Patentees and Inventors. 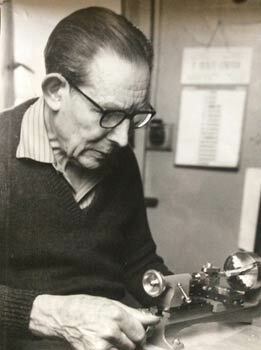 During those self-employed years in Hendon I remember many interesting projects coming over his bench. He made a cut section of an apartment block for English Electric showing a basement boiler installation that powered the under floor heating of the, I seem to remember, four apartments. The sections of the apartments showed the dining and sitting room, which he also furnished, cutting up his ties for the upholstery coverings because the patterns of the silk were the correct scale. He also made decorative items. I particularly remembered the miniature fruit bowls filled with tiny bananas and apples. 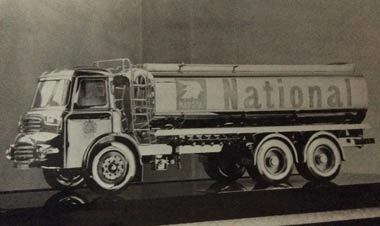 National Benzole, the petrol company, commissioned him to make a scale model of one of their road tankers to be used as a trophy for the depot with the best safety record. Made of copper and brass, able to be completely disassembled for silver plating and not one fastener was to show that was not on the full size tanker. The result was magnificent. When Dad delivered the model to National Benzole, they decided to mount it on black glass instead of a wood plinth so that the workmanship on the underside, with its pipes, hoses and valves could also be appreciated. Around 1960 Dad’s association with the puppeteer, Jim Fletcher, came into play again. Christine, Jim’s daughter, who was an artist and a professional puppeteer, was working for, at that time, a small film production company called AP Films. They made 8mm short films in which puppets enacted the plots and which could be rented out to events, such as kid’s parties and such. An opportunity arose for AP Films to make a series for television and they took up the challenge. However, the attempt was not a success. When making their 8mm films the company would run the action and the dialogue separately and then combine the two. This process could not be done for TV. The action and the dialogue had to be produced simultaneously and the noise of the strings, which were threaded through the puppets heads to move the eyes and mouths, obliterated the dialogue. When Christine told her father the company were not successful because of this problem, only one person’s name came to his mind. I was, in turn, aware from being very young that my Dad was unlike any of the dad's of the kids in my street. For one thing of course there was the workshop where I spent a lot of time. When I was very little it was in the ‘box’ room and I think he had one lathe (a treadle model according to his colleagues). I was about 5 when Dad produced the Cooper Bristols for REDeX. At the time he was recovering from TB and although I had always spent a lot of time in the workshop with him, having him at home meant I was with him even more. Maybe it was just to keep me busy, but I was thrilled when he taught me to use the drill press and had me drill the holes in all the wheels for the Coopers. Happy Days! By the time he produced the Cooper Bristols he had taken over the dining room and the old Anderson air raid shelter left over from the war was his bench. Top shelf: NL 1952 Chassis, railcar, Fleche do'r motor. My mother returned to nursing when I was about two years old and, I think about the time my brother was killed, started to do night duty three nights a week. This meant I spent even more time with Dad. He loved music and although not as involved as some of his brothers, one played in a dance band, he could get a tune out of a harmonica and he loved to sing. He did not have a ‘good’ voice but as he worked he would sing to himself, ‘Always’, ‘Carolina in the Morning’, ‘Red, Red, Robin’ and ‘Over the Rainbow’ were all great favourites. Away from the workshop he was a very indulgent father for a little girl. I loved to play tea parties and he would always make tea for my teapot and give me real milk and sugar. The sandwiches, of course, were always to scale! Our greatest shared pleasure was reading and he read to me every night until I was almost a teenager. 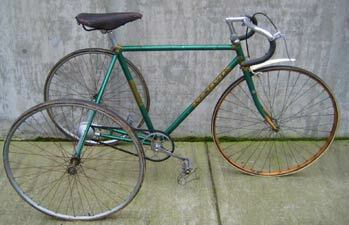 In about 1963 I met a chap who had been in the Willesden Cycling Club with my brothers and I introduced him to my Dad. This young man’s first words to my Dad were "We’ve got a ‘photo of you at our house!" 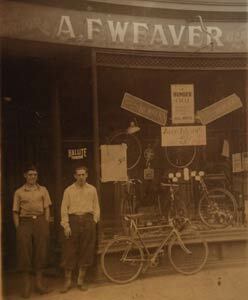 He was the son and nephew of two of my dad’s old pals from the cycling club days before WW2 and recognized Dad from a ‘photo of the three of them taken during those times. Through him Dad was reunited with his pals who were still members of the Glendene Cycling Club. Both Mum and Dad became honorary members of the club and were great supporters, marshalling many a Sunday morning road race. 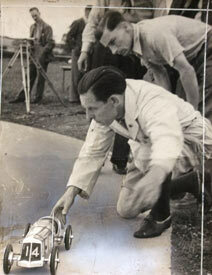 They got to know many of the stars of the sport of that time and were friends and great fans of Beryl Burton. In 1967 my husband, who worked for the GPO, was transferred out of London to the GPO Training School at Yarnfield, just outside Eccleshall, Staffordshire. Just after we moved, Mum and Dad came to visit and within the week had bought a bike shop in Eccleshall in Staffordshire, close to Gerry Buck , Although Gerry was a pal from the days of the cars and hydroplanes it was only after my parents move to Eccleshall that Gerry became a close family friend. Especially after their move to Wales he was a frequent visitor. He and Dad got into hot air engines in those latter days and I remember Mum describing the three of them, Mum Dad and Gerry, sitting at dinner with three or four hot air engines jogging away on the table while they ate. A mental image I treasure! Gerry was a huge help to my brother when he had to find homes for Dad’s lathes, tools and materials. They lived there for about 4 years before moving to Wales. They had about a year and half of a very happy retirement in Wales before Mary Weaver died suddenly in 1973 and tragically, Arthur just eleven days later.